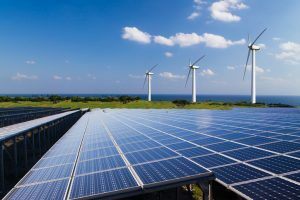 Utility scale batteries notn only back up the existing Texas electric supply but might eventually help renewables bury most fossil fuel generation. Will utility-scale batteries take charge in Texas? With a $1 million grant from the Texas Commission on Environmental Quality to help fund the project, Irving-based energy company Luminant announced last month to build the largest utility-scale battery in Texas. This device will sit next to Luminant’s solar farm in Upton County and store up to 10 MW of electricity the solar array generates. The battery is scheduled to be installed late this year. Think of the utility scale battery like your car’s battery. While the engine runs, it recharges the battery so you can use that power next time you need to start your car. Utility scale batteries store power to meet later demand. Batteries intended to store electricity for the ERCOT grid are typically located next to power generating plants like solar farms. Luminant’s West Texas solar farm is one of the largest in Texas. At full capacity, it’s electricity production is enough to power 56,700 average Texas homes. During peak demand, the solar farm can supply about half that number of homes. Though Texas currently only gets one percent of its electricity from solar energy, battery projects like this one could change that proportion. While peak usage hours tend to be 4 p.m. to 6 p.m., solar energy harvestingdoesn’t align with those hours. Batteries make it possible for storing electricity generated during low-demand periods to be released during peak demand. By storing power for later, batteries make intermittent renewable energy sources even more competitive —and that means cheaper Texas electricity rates. Why invest in solar now? Luminant’s parent company is Vistra Energy which also owns giant retail electricity provider TXU Energy. With a combination of tax credits and vertical integration between power source and retailer, Vistra Energy sees the battery project as a strong investment. TXU Energy promotes switching toTexas electricity planswith free nighttime energy and solar powered daytime power. Utility scale batteries like the one Luminant intends to build make these plans more advantageous to TXU and could lead to lower prices for customers. Battery storage capacity on the Texas grid was all but stagnant between 2012 and 2016. Since 2016, capacity has increased 250 percent from 37 MW to 89 MW. Increasing battery production and placement in the Texas grid could also lead to a more active electricity arbitrage market in Texas. The aim in this market is to produce electricity when prices are low and sell it when prices are high. This hasn’t been done much in Texas, but that could change as the utility scale battery market expands. If you’re ready to switch your electricity plan to one that uses solar energy or other forms of green energy, study the plans on Texas Electricity Ratings. You could find a plan that is good for the environment and great for your home energy usage. Shop Texas electricity planstoday to see which one works best for you. Your Unsealed Crawl Space Is Costing You Money!